Jeremy Bowen’s Bias Revealed: Muslim Brotherhood "Conservative, Moderate and Non-Violent"
Yesterday, As I See It posted a comment in the open thread about how Lyse Doucet gave a report on Radio 5 in which she gently sanitized the Muslim Brotherhood ( I can’t find a link to it right now, but if someone points to it I’ll add it here). At one point, she apparently slipped up and said that Salafists are “extremists….er…..let me say strict….” Oops, nearly tanked the Narrative there. In any case, I was reminded of a post I saw by Jeremy Bowen back in February, where he said that the Muslim Brotherhood are “conservative, moderate and non-violent”. WTF? I said to myself. How can they be both? By definition one cannot be the other. Any group calling for Shariah Law cannot be moderate. Yet Bowen saw no problem saying it. However, somebody had a problem with it, as he stealth-edited it out quickly. I failed to take a screenshot at the time, assuming News Sniffer would catch it if anything happened, but when I went back the next day, “moderate” had been removed, and News Sniffer had nothing. So I gave up on it. Why would he say such a thing? 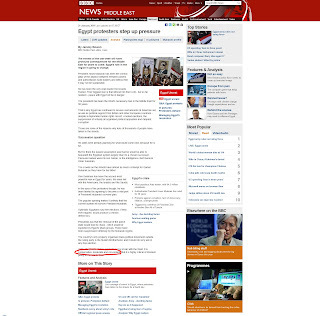 Somebody pointed it out to him, and he or an astute BBC News Online sub-editor sent it down the memory hole. Wake me up when a Beeboid says the same thing about the Tea Party movement. If anyone still had a modicum of trust in Bowen’s reporting, it’s surely shredded to pieces now. He’s obviously partisan, and not thinking clearly. Defenders of the indefensible may dismiss this simply because it’s 10 months old, but I fail to see how that makes any difference. Bowen truly believed it, and clearly meant to sanitize the Muslim Brotherhood so the license fee payers wouldn’t get too worried about them. He’s not, so why should you be? I’m sure his superiors at the BBC know all about what he really thinks, and simply don’t care. Some of them may even agree with him. It’s irresponsible, not to mention delusional. I’d say it’s impossible to trust his reporting on Egypt any longer. 22 Responses to Jeremy Bowen’s Bias Revealed: Muslim Brotherhood "Conservative, Moderate and Non-Violent"
Any competent psychoanalyst would conclude that Bowen is the type of subject worthy of an exclusive conference. i posted this yday morning. – so many differing factions in it ????? – he & t.blair “hoping” that things “could” get better with them holding sway. – it will be “more democratic” with them in power???? this is a disciplined extremist islamist party. INBBC censors Muslim Brotherhood’s ‘The Project’. 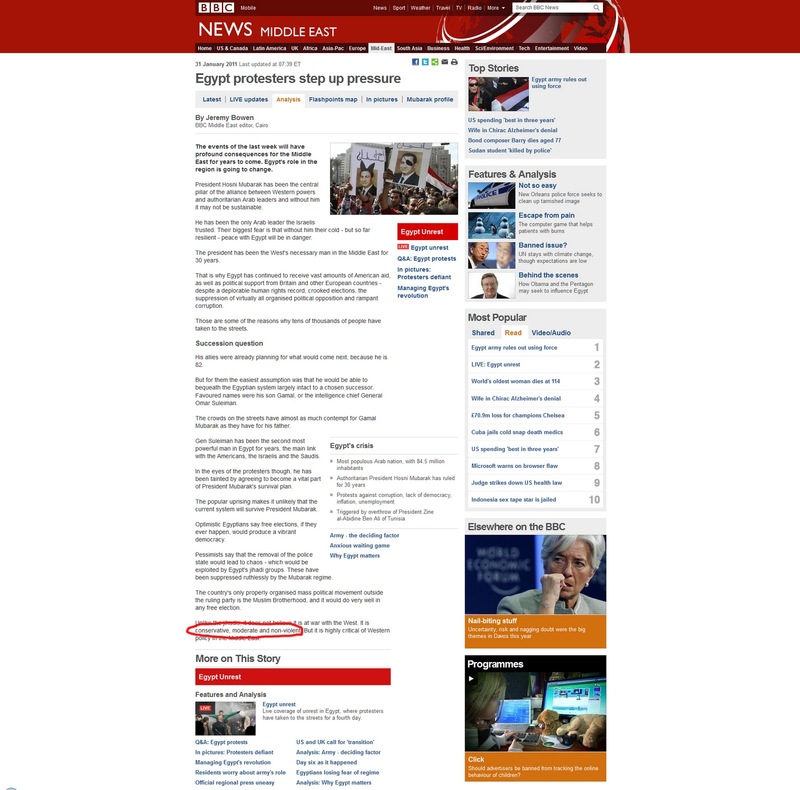 Bowen and INBBC deliberately conceal the truth about the nature of the Muslim Brotherhood and its political intentions. In its way, INBBC is acting like a political agent for the Muslim Brotherhood. I’d say it’s impossible to trust his reporting on Egypt any longer. David, that implies that it’s been possible up to now. Can I reccomend this book for anyone who wishes to discover how the Musim Brotherhood gave birth to Al Qaeda. P.S> Anyone know how I turn links in to highlighted words using Safari? *Write or copy/paste the words into the coment box. *Click the link button above the comment box. *Paste in the URL you wish to link to. Don’t be ridiculous, everone knows that the Americans created Al Quaeda and so deserve all that AQ does to them. The BBC told me this so it must be true. Looking at the thread above, maybe a ‘jobswap’ between Mr. Mason and Mr. Bowen is on the cards? Beyond ideology, they have no real qualification to do their respective editor functions, so there should be little discernable difference and, as they say, a change is as good as a rest. Although INBBC is so appeasing towards Islam: avoiding criticising or even using the words ‘Islamic jihad’ or ‘Sharia law’, where does INBBC end up? Being castigated by the Islamic Republics of Pakistan and of Iran anyway! The British government should reciprocate by blocking any Pakistan-based satellite TV stations aimed at the Muslim Pakistani diaspora in Britain. It’s a two-way street, Islamabad. If Britain does not do this, Islamic interests will construe it as political weakness. one of their stated aims is to create a state ruled by Islamic law, or Sharia. Banna created a paramilitary wing, the Special Apparatus, whose operatives joined the fight against British rule and engaged in a campaign of bombings and assassinations. …the group was accused of assassinating Prime Minister Mahmoud al-Nuqrashi. Qutb’s work advocated the use of jihad (struggle) against jahili (ignorant) societies, both Western and so-called Islamic ones, which he argued were in need of radical transformation. His writings – particularly the 1964 work Milestones – inspired the founders of many radical Islamist groups, including Islamic Jihad and al-Qaeda. But apart from this kind of stuff, for Bowen they’re moderate and non-violent. Quite hard to see how they differ from Al-Qaeda in their objectives. For Egypt’s eight million or so Christians, the Brotherhood’s call for Sharia law to be made the law of the state is particularly worrying. Attacks on Christians have been on the increase. On New Year’s Eve, 21 people were killed in a suicide bombing outside a church in Alexandria. They interview a Christian woman, and also name her, so she had only good things to say about what was going on in Egypt. In contrast, BBC-NUJ’s Ms Rainsford wrote a piece on Spain a couple of days ago, about the ‘fears’ of homosexuals, bisexuals and pro-abortionists now that a ‘centre right’ political party is in office. ferrying them to the poll etc etc…..
And another case of INBBC’s enforced misleading description as ‘moderate’, is the ruling Islamic party in MOROCCO.